LE PETIT MARCHÉ will open its doors at Melrose and El Centro. At long last, the restaurant and gourmet market under construction at the north end of Larchmont Blvd. is ready to open its doors to the public. 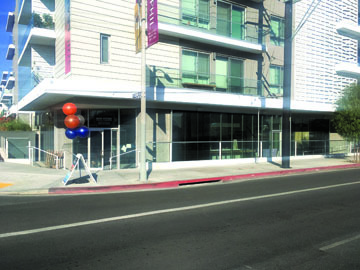 Le Petit Marché, located in the first floor commercial space of the LC Apartments at the corner of El Centro and Melrose, will open this month, according to publicist Heather Boylston. The exact date is not yet confirmed. The space will feature a restaurant and full bar with seating inside and outside for more than 100 people. Also included is a gourmet market filled with pre-made sandwiches and specialty items. “We are thrilled to be able to provide the Larchmont community with a place they can do it all — shop for a meal to cook at home, have a breakfast meeting, grab a coffee, meet friends for lunch and linger to happy hour,” said co-owner Mathew Cape. Cape and his business partner, Spoon Singh, also own The Larchmont, a converted Craftsman house located on the corner of Lucerne and Melrose. For years the space operated as a restaurant, but last fall the two men transitioned it into a private event venue. Please advise me of your opening date when you have one. I’ve been waiting – impatiently – and I want to be (one of) the first in line.